With all the talk about getting more women in technology, I&apos;m always looking for female-run companies. Recently, I got an email from Preemadonna, which bills itself as a San Francisco-based company that focuses on using technology to provide lifestyle products for women and girls. That sounded good. Then, I looked at the product. It&apos;s called the Nailbot. And its premise is to instantly print art onto your fingernails using your smartphone. Is this the cutting edge of women-centered technological innovation? 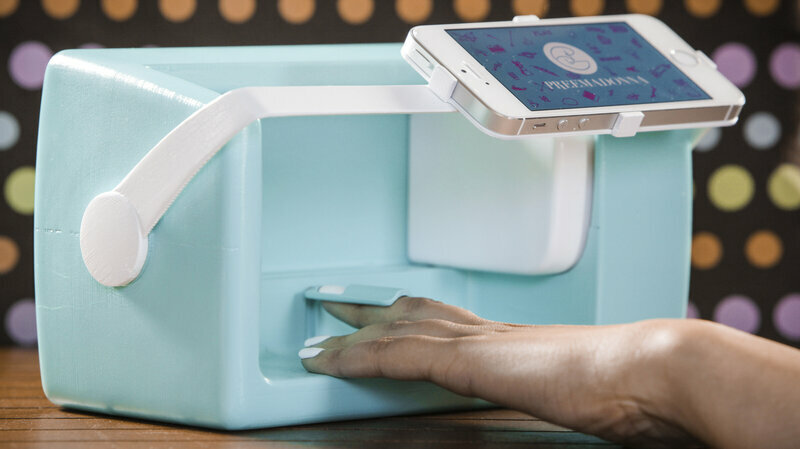 I asked CEO and Co-founder Pree Walia, and the way she laid it out, it was like the Nailbot was a gateway drug for girls to the world of technology: Preemadonna is trying to meet many young girls in a place where they can express themselves and have fun. "It is a beauty tool, but for young girls it&apos;s a learning tool," Walia says. Walia says when they see the Nailbot, which will sell for about $199, both girls and boys want to know more about the technology behind it. And Preemadonna is pitching it as both a beauty device and a sort of arts and crafts tool. "Girls can design their own Nailbot art," Walia says. "It&apos;s really a mobile platform for art with uses well beyond fingernails." Nail art may actually be a smart place to start from a business perspective. According to Mintel, which does research on the "beauty market," 92 percent of girls between 9 and 17 years old use some kind of nail product, making nails the most popular cosmetic item among teen girls. The two women who founded Preemadonna came at it with credentials in both business and tech. Walia has an M.B.A. from the University of Chicago and spent several years working in startups that focused on LED lighting and building automation. Co-founder Casey Schulz has degrees in mechanical engineering and has worked at NASA Ames and the Lawrence Livermore National Laboratory. Still, there&apos;s a part of me that wants women in the startup world to focus on something heavier — a new method for detecting breast cancer, a better way to report assaults. But maybe this is as good a start as any. After all, a lot of boys get drawn to technology by playing shoot &apos;em up video games, and Mark Zuckerberg founded Facebook on top of a site he had originally set up to rate who was hot and who was not on the Harvard campus. Preemadonna has raised $400,000 from investors, according to Walia. And the first investment came from college pal Diane Donald, wife of golf champion Luke Donald. The CEO says a lot of male venture capitalists have looked at her and said, "Is this just a fad, Pree?" It might be, but so are numerous startup ideas pitched by men. And maybe there&apos;s a chance that this one gets a few more young girls interested in tech. "I don&apos;t go around in a hoodie," Walia says. "I have a dress and I have high heels and I own it."